Open Reflections on Mourning Ritual in Egyptian Geography. Did the nwn m gesture come from the north? Did the nwn gesture have its origin in Upper Egypt? Had the nwn gesture its origin in the Myth of Osiris? And was it typical from Abydos? Were both gestures from Abydos and nwn m was extended to the north, while the nwn was extended to the south? Did the election of one or another gesture depend on the place the burial took place? Was the nwn m gesture introduced from the north in the royal funerary habits of New Kingdom? While mourners pulled and/or shook their hair in Egyptian funerals, what happened in Nubia? As we can notice, the matter is still full of questions with no answer. Many doubts come to our mind and we need to study deeper, slowly and with more documents. Shaking, Pulling, Cutting and Offering the Hair in Ancient Egypt Funerals. There are more examples of these women shaking their hair forwards than pulling their front lock of hair and it seems quite safe to affirm that in Ancient Egypt there was the habit of cutting and offering hair to the deceased. We could conclude that Egyptian mourners shook more their hair than pulled it before cutting it, but it would not be precise, because archaeology and ancient history are not exact sciences and we just count on the documents the chance has preserved. From the chronological point of view it seems that the New Kingdom has more activity, although it is obvious that it comes from the amount of examples of decoration it remains. Was really the nwn m gesture the main one during the Old Kingdom? Was the nwn gesture more in vogue from the Middle Kingdom on? If both gestures coexisted, was still shaking hair the preferred one? Open Reflections on Pulling Hair in Ancient Egypt . The nwn m gesture of pulling the front lock of hair. As we can see in the graphic here below the nwn m gesture of pulling hair is very present in the Old Kingdom, while we have no documents of it from the Middle Kingdom. It appears again later and especially strong in iconography. Documents from the Late Period on are less. Which ideas can we take from? 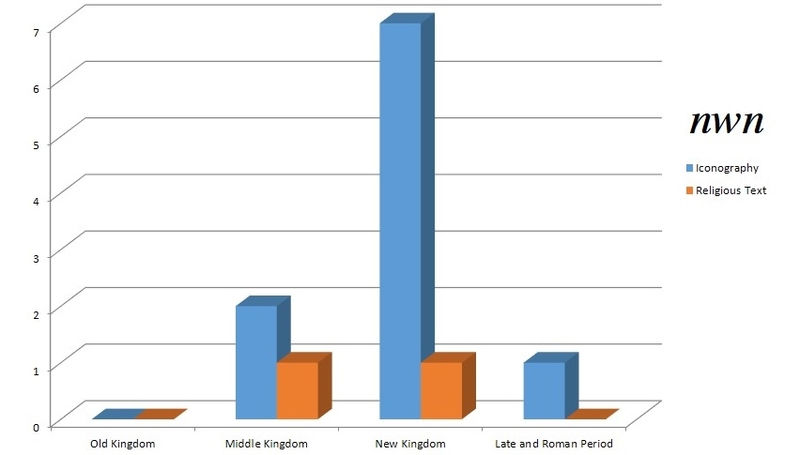 If we have to take notice just of the data, we could understand that the nwn m gesture disappears during the Middle Kingdom for appearing again in the New Kingdom, but does it make sense? We think the answer is no. In this case we guess we have to hold chance responsible again for it. Maybe the point is that such a sacred practice had not an orthodox way of being expressed, or in religious texts, or in iconography. Once in the New Kingdom the decorative activity gets so intense and sacred texts increase little by little religious and artistic collectives establish some rules or some principles. From that moment on we can distinguish between the common mourners and the professional ones, both making similar gestures, but with different meanings and in different moments of the funerary ceremony. Open Reflections on Shaking Hair in Ancient Egypt. If we organise all the data in a graphic, we can more easily make some reflections for proving that the matter is still too far of being closed. Let’s see what we have about the nwn gesture of shaking hair forwards. If we just look at the evolution we see that there is no trace of an explicit nwn gesture in the Old Kingdom. 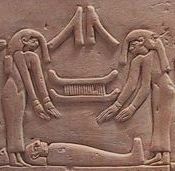 It seems that during the Old Kingdom the normal practice for mourners (the common ones and the two representatives of Isis and Nephtys) was to pull the hair (nwn m), not to shake it (nwn). This last one appears in documents from the Middle Kingdom, and the New Kingdom is the most prolific period, mainly in iconography. Does it mean something? Was the nwn gesture of shaking hair sm3 forwards developed sometime before the Middle Kingdom; let’s remember that in XI Dynasty it is already entirely developed, as the stele of Abkaou proofs in the Festivity of Osiris. Could we think that the nwn gesture was something that belonged just to the Festivity of Osiris? And later on it was included in the funerals of common people? Maybe it has been a matter of pure luck and documents have not preserved (or have not been yet discovered) for knowing that the nwn gesture was also made by the two professional mourners in the role of Isis and Nephtys during the Old Kingdom. In fact the Pyramid Texts say they pull their hair sm3, not their frontal lock of hair swt. Could it be a trace of the nwn gesture in the professional mourning ritual at that time? On the other hand, the corpus of scenes the artists had for the private tombs of the Old Kingdom did not include images of the funerary ceremony nor of the Opening of the Mouth ceremony. So, the nwn gesture could be made in the mourning ritual of the Old Kingdom, but we cannot see it because it was not represented.